Audiences have been spellbound by the on stage chemistry and stagecraft at Harry Potter and the Cursed Child in Melbourne, but few would realize it all came together under our roof. With ticket sales reaching well into 2020 the production looks set to repeat the success of its run in London’s West End in 2016 and New York’s Broadway in 2018. A BBC producer has heaped praise on Victorian screen crews who worked on the hit mini-series The Cry. Glasgow based executive producer Claire Mundell said she loved filming in Victoria so much that she’s looking for any excuse to work here again. The four part psychological thriller was based at Docklands Studios in 2018, which Mundell described as “like having our own backlot”. The BBC-ABC co-pro, which aired in Britain and Australia recently, tells the story of a young couple whose baby is abducted from a small Victorian coastal town. The vast talent of Victoria’s screen creatives was on show recently when the state welcomed its biggest production in ten years. US TV Series Preacher will employ more than 700 local cast and crew and sink more than $50 million into the state’s economy while shooting at Docklands Studios and around Victoria over the next several months. TV reporter Madeline Slattery joined Minister for the Creative Arts Martin Foley on a behind-the-scenes tour of our construction workshop while sets for Preacher were taking shape. We’re celebrating 10 years of State Government ownership. In 2008 the Victorian Government bought Docklands Studios Melbourne, then known as Melbourne Central City Studios, from a private consortium that opened it in 2004. Things have changed a bit in the past decade – vacant industrial land surrounding the facility is now a vibrant tourist and residential precinct while we’ve been busy building a reputation as a friend of the state’s screen sector. Combining forces with Film Victoria, we’ve brought dozens of film projects of all sizes to Melbourne, the latest being a US TV Series being shot in our stages in 2019. CEO Rod Allan says government ownership has allowed the facility to be driven by more than commercial interests with its primary aim being to generate activity in the Victorian screen sector. Coinciding with the ten year anniversary in late November, a group of around 30 producers from around Australia toured the facility during the Screen Forever conference in Melbourne. January: Our favourite Ambassador pops in for an advertising photo shoot. February: Sci-fi thriller Upgrade (production designer Felicity Abbott) wins our DSM Best Set Trophy. March: Our new ad campaign hits the newsstand inside IF Magazine. April: Tech giant Microsoft takes over our stages for a one-day IT networking event. May: Our stages become a sport arena for the NBL’s 3×3 Pro Hustle. July: Shane (with ankle injury) and Clayton Jacobson stop by on their Brothers’ Nest promotional bus. August: A busy day on the lot. September: James and Michael from YutArt get an early morning start on our new showreel. October: The Whistleblower shoots some final action sequences. November: The hottest ticket in town at Australia’s annual gathering of producers. Can’t wait to see what 2019 brings – Happy New Year to all! Hailing from Sussex in the UK, Philli has made a name for herself as a stunt performer since arriving in Australia a decade ago. If all goes according to plan, she’ll become Australia’s first fully fledged female stunt coordinator. A familiar face at Docklands Studios, she stopped for a chat as her work on The Whistleblower wrapped up. Well I didn’t really mean to! I came over from England as a dancer and that industry isn’t as strong here as in England so I got in touch with a stunt coordinator instead. After the first meeting I said I want to be the best in the world at this, and he just said “we’ll see”! Through every step I’ve been supported by everybody in the film industry. I’m not sure how I’ve ended up here but it’s great. Is that a weird transition from dance to stunt work? Well it’s kind of irrelevant how you get into it because the scope of what we do in stunts is so broad. One day you can be in the water and the next day you’re jumping off a building or setting yourself on fire or crashing a car or doing a big fight sequence. So whichever path you come in by, you still have to expand your skills base and your knowledge so it’s about what you do once you get the opportunity. How many productions have you worked on? A fair few – easily over 50, most in Melbourne and a lot at the studios. For us as an industry it’s great to have a base here (at Docklands) because we know everything about the studios and where every department is – little things like where all the points are, how to access the grid, the best pathways to move our equipment. You must have had a fair few injuries? The least dramatic was the worst injury! I took a bit of a knock (to the head) and went to sleep for a bit. It was in the silliest of situations. You do so many crazy big things and then when you least expect it something happens but, touch wood, we’ve got a really good safety record here in Victoria and we have so many protocols to go through to stop injury. I think I used to be a lot more nervous in the old days. There was one stunt in particular that kept me awake where there was a big explosion and I was wrapped in a wire and as the explosion went off I went up through the flames and landed on the ground with no mat. And we don’t usually get a rehearsal immediately before the shoot – maybe the day before but not on the actual day. We have a saying, “eat a cup of concrete for breakfast”! The Whistleblower is a Chinese-Australian co-production, how do you manage the language barrier? Hand gestures, lots of thumbs up! There’s always a way and I guess that’s what makes it fun and you have to know they know what they’re doing, and be able to communicate with them if they’re not happy with something. How long before you’re a fully qualified stunt coordinator? If I qualify as a stunt coordinator it will have been a ten year process which is the minimum amount of time you need. I have to get another 12 months experience of being an assistant stunt coord first. Whistleblower is the biggest production I’ve worked on as an assistant stunt coordinator. So I’m in charge of putting the safety elements in place and making sure all the workplace requirements are met. A lot of work is to do with casting, getting a double that’s a match for the actor, finding creative ways to do stunts. Ultimately you want to get them to do as much as they possibly can within the realms of safety. So we don’t want them to jump off a building or anything but we’ll get them up to the point where a trained professional takes over, and in order to do that we have lots of safety protocols and ultimately they can say “no I don’t want to do that” or” I don’t feel safe”. Stunt performers are not recognized in the Oscars? Is there’s a campaign to change this? Ultimately we’re the people that aren’t really there! Actors like to say they’ve done their own stunts and to a point they do, but they’re all worked out by a stunt team and the more complicated elements done by the stunt team. We’re the ones not to be seen. You have to know that someone else is going to take the glory! Thanks to Genevieve Stanley for assistance in compiling this article. If our studio is anything to go by, Victoria’s screen sector is flourishing. Every square inch of our lot was occupied recently, including five sound stages, production offices, set construction workshop, costume and art departments. Our biggest project in nearly 10 years The Whistleblower wrapped in early October after a three month shoot that poured more than $40 million into the state’s economy and provided work for around 200 crew. The made-for-China feature attracted widespread media interest while shooting Victorian locations as Malawi and major action sequences at Hazelwood Power Station. Hot on the heels of The Whistleblower are a number of other film and TV projects setting up shop at the studios, including the psychological horror Relic. The debut feature for director Natalie Erika James, Relic portrays three generations of women haunted by the effects of dementia in the family home. Relic is based at Docklands Studios for several weeks while shooting on location around Victoria including Creswick, Woodened and Moorabool. Another project taking shape in one of our sound stages and on location is Channel 9’s Bad Mothers. The series about five modern women whose lives collide stars Tess Haubrich, Melissa George, Mandy McElhinney, Jessica Tovey, Shalom Brune-Franklin, Daniel MacPherson, Don Hany and Steve Bastoni. One of Australia’s most experienced stunt performers, Chris Anderson has lost count of screen projects he’s worked on, but reckons it’s well over 100. Anderson returned to Docklands Studios Melbourne recently for “about the thirtieth time” to join the big Chinese Australian co-production The Whistleblower. Bel Tromp asked Anderson about his best and worst days as a stunt actor. How did you get your break in the film industry? I started in ‘75 as a 17 year old on Cash and Company doing fight scenes, followed by Eliza Fraser the next year but my first big movie was Mad Max filmed in ‘77. I landed a job working behind the scenes as a safety guy for some of the car crashes and was then asked to ride a motorbike off the Kirk Bridge (near Little River, Victoria). It was for a scene near the end of the film when there are four guys with motorbikes. Grant Page and I each rode a bike off the bridge about 30 feet down into a very narrow creek. It was probably one of the hardest stunts I’ve done and one of the least paid! You went from stunt performer to stunt coordinator, is that a big step? There’s only around 8 qualified stunt coordinators in Victoria, compared to about 60 general stunt people working more or less full time. To do this job you have to coordinate people around you and bring them together to create the director’s vision. You don’t have to be the world’s best stunt performer but if you don’t know what it’s like putting your life on the line it’s hard to ask someone else to do it. I’m a bit old school, from a time when there were no wires and that type of thing, and I expect the young guys now to push themselves as hard as I did when I started. So if I’m asking for a hard knock I want a hard knock – obviously without anyone hurting themselves! You’ve literally put your life on the line? Yeah, I was working as a stunt coordinator on a film called Wings, about the America’s Cup (note: filmed in 1991 and released as Wind in the US). I was about 10 miles out to sea having lunch when a boat in the shoot tacked over the top of the boat I was on and sort of punched me off. I had one leg either side when I hit the keel and I just broke in half, fractured my pelvis in eight places, crushed the artery in my leg and did quite a lot of internal damage. There was no blood flow to my leg for hours while they fixed my internal organs so my leg just died. It’s called compartment syndrome and they couldn’t save my leg so they just cut it off. Some people said ‘that’s the end of him’, but this industry’s fantastic and accepted me back and helped me get through a learning curve – there was nothing wrong with my head but my body just didn’t work as well anymore. You’ve been around long enough to be able do to some serious name dropping – so go for it! You’ve recently been on The Whistleblower, the biggest project at Docklands Studios and in Victoria in 10 years. Has that been fun? The project is so huge we took nine or ten days to shoot a car chase in Geelong. The thing I loved about the script was it just said AND A CAR CHASE HAPPENS and ACTION TO BE DETERMINED so it was a blank slate. I was in charge of action unit and I designed a few of the stunts. At Hazelwood Power Station in the La Trobe Valley we shot a really long foot chase. We had to create large mechanical devices to move from one spot to another so it was quite complex in the rigging and the implementation. It’s a huge space nearly one kilometre long and fifty metres wide and to get from one spot to another we came up with an 80 foot crane. There were dozens of people on the stunt team. What’s it like working on a Chinese co-production? Well the director speaks no English whatsoever so everything we talked about went through a third party. The other trick was getting the actors to do what you want, but body language really is a common language. I wouldn’t have got this job if I hadn’t had overseas experience – I’ve worked in Thailand and Russia and in India on eight or nine Bollywood films. One of your other projects this year was Ride Like a Girl (based at Docklands Studios) about Melbourne Cup winning jockey Michelle Payne, directed by Rachel Griffiths? I came in to do 10 days work and ended up working for 11 weeks! It wasn’t as much stunt coordination as the action with the horses, the crossover between jockeys and thoroughbreds and film horses and working on a film set, so I became the race liaison officer. (Lead actor) Teresa Palmer had ridden a horse before but I put her with the right people so she would look good riding a horse at a canter. You’ve been around a while – where is the industry at in Victoria? Are you serious? It’s so busy. All the stunt coordinators are working on multiple jobs. There’s True History of the Kelly Gang, Bloom, Glitch, Relic – about eight or nine projects at the same time. I think producers like what’s going on here – we’ve given them a good taste of what we’ve got to offer and they want more. If you could tell your teenage self how your career would pan out, what would you say? I’d say go for it! I wouldn’t change a thing. I believe I’m one of the most blessed people in the world because when I was 17 I fell in love with this industry and doing stunts. I was saying to the guys the other day that I still love it. I might tell my teenage self not to work on this or that film but in the end I’d just say go for it! The Whistleblower is a thriller following the story of a Chinese expat who uncovers a conspiracy at the company he works for. Led by acclaimed producers Bill Kong (Crouching Tiger, Hidden Dragon, House of Flying Daggers) and Greg Basser (Concussion, Goosebumps and Chinese productions Cold Wall II, Rise of the Legend) and female director Xue Xiaolu, the film stars Chinese actor Jiayin Lei (Guns and Roses, Brotherhood of Blades II) in the lead role. Shooting from June until October, the production has spent more than $40 million in Victoria. In addition to using Docklands Studios largest sound stage, the production filmed in several locations across the state including Dandenong, Footscray, Werribee, Geelong and the Latrobe Valley. The project received financing through major Chinese-based companies Perfect Village, Edko Films and Beijing Carving Films with investment from Film Victoria and assistance through Screen Australia. Roadshow Films will distribute the film in Australia. The Whistleblower is the biggest foreign production in Victoria in 10 years. Fairfax Media’s senior entertainment writer Karl Quinn looks at how the production has used Melbourne’s outskirts for scenes set in Africa. 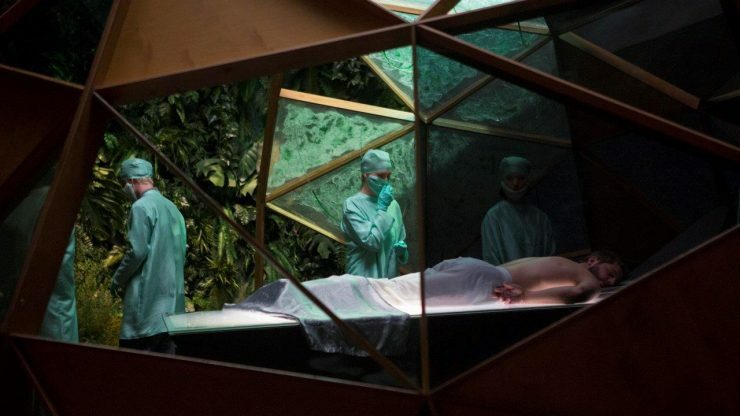 Production Designer, Felicity Abbott APDG outlines her approach to working on Australian director Leigh Whannell’s new feature film, Upgrade, shot at Docklands Studios Melbourne in 2017. Upgrade is set in the near-future when technology controls nearly all aspects of life. But when Grey, a self-identified technophobe, has his world turned upside down, his only hope for revenge is an experimental computer chip implant called STEM. Produced by Blumhouse Productions (Get Out) and Goalpost Pictures (Cleverman, The Sapphires), Upgrade was supported by the Victorian Government through screen agency Film Victoria’s Production Incentive Attraction Fund. While Abbott has created every period in Australia from 1780s to present day, sci-fi is a genre she’d seen on screen but never designed. But this seems to have worked in her favour, with Whannell seeking a fresh and distinct vision of the not-too-distant future. Bel Tromp (BT): Tell me about the inspiration for the futuristic design? 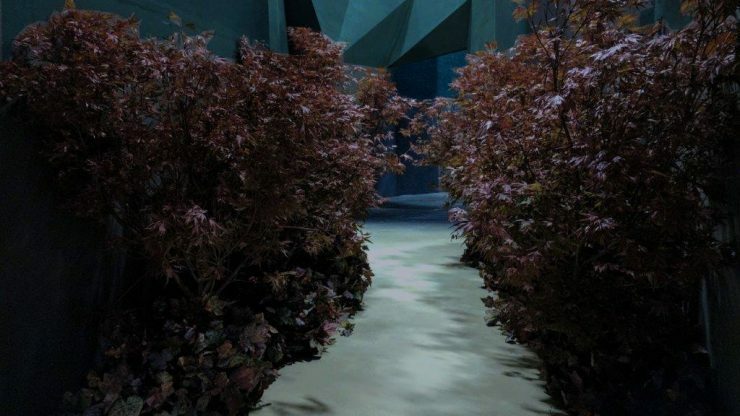 Felicity Abbott (FA): It’s a world that exists at the interface of high and low technology so it was immediately interesting and appealing to me as a production designer in terms of creating worlds. It was always described as a world just around the corner. So in terms of the visual style, it’s a reality that we understand from our contemporary experience, with an enhanced view of current technologies rather than a departure from life as we know it. (BT): How did you go about building the visual references? FA: Leigh thought it was hilarious that I’d never seen Robocop and he joked that was the reason he hired me because those fantasy genre films weren’t my primary reference point. Leigh described the film as “future noir”. It’s a mix of genres ─ it has science fiction, horror, action and comedic elements. We had lengthy conversations about what will be commodities 20 years in the future. In my mind, it will be things like clean water and air, food, renewables and sustainable environments. Also there will be an inclination toward natural materials, so for the sets at Docklands Studios I referenced rammed earth architecture and drew inspiration from naturally occurring fractals and geometry such as webs and nests that are undercurrents rather than being obvious. Leigh’s a very generous director in terms of his collaborative approach so he and I worked very closely together. I challenged some of what was scripted in terms of character environments, and together we really developed those ideas in a way that is quite unique. BT: What was the balance between sets built at Docklands and shooting on location? FA: The two sets at Docklands were the most significant, as they were the two character environments ─ one the interior of Grey and Asha Trace’s house, and the other the interior of hacker Eron’s mansion containing his laboratory and work environment. They were built on separate sound stages and during shooting we were swapping from one stage to the other. Our whole production was housed at Docklands ─ the art department, the construction workshop and costume, so it was a pretty big operation. BT: How long did it take to build the sets? FA: We had a peak period of about six weeks where we had to put on additional construction crew because we had so many sets going at once. We’d built complex models and there was a lot of discussion around those, and Ross Murdoch managed the construction in the big workshop at Docklands. I had some incredibly skilled and experienced professionals from Victoria in the art, construction, scenic, vehicle, greens and props departments. BT: The futuristic vehicles are a big part of the film, what was involved in building them? FA: We had a dedicated workshop just to build the automated and police vehicles. For one of the cars, we built a smaller set of the interior that we shot at Docklands and then we built exteriors that were actually driven on a road that was blocked off for the shoot. Those cars were driven by stunt drivers in Chris Anderson’s team and on screen it’s shown that the driver sees the outside world through cameras and sensors, or they can be making a video phone call or reading email. So there was complex VFX interaction that required a green screen and other elements. BT: How did you use locations around Melbourne as part of this futuristic world? FA: We found things in the suburban environment that had the tone and feel of generic US cities and suburbs. I would always check with the American actors and they thought the tone was pretty spot on. We used a vast stairwell at RMIT University in the city. Also, we shot on the Mornington Peninsula near Melbourne to establish Eron’s world. He’s this genius young hacker living in a kind of subterranean environment. We shot scenes on a cliff with beautiful sunsets and for the entrance to his world we built enormous rocks and used DSX (Digital Set Extensions). We also had a backlot at Collingwood Arts Precinct with about ten sets of various sizes with lots of built elements, elevators and set pieces and that was a great adjunct to filming at Docklands. BT: What was your experience working at Docklands Studios? FA: I absolutely loved working at Docklands, it’s a wonderful facility. Our art department was above the construction workshops and for me and the art director Mandi (Bialek-Wester) we were in and out of the workshops multiple times a day so it’s efficient in the way it was set up. The art department offices are some of the best that we’ve worked in and Docklands Studios has really attentive staff and great crew, so for me it was a fantastic experience. I also liked its proximity to everything we needed, very close to the city. BT: You’ve seen the final cut of Upgrade – what is your impression? FA: I went to the premiere at SXSW in Texas (in March) with Leigh and the producers from Australia and the U.S. and the editor and the composer from Victoria. It screened at midnight which was a great experience and the audience was very responsive. It’s a wild ride and a very high energy film. BT: Since working on Upgrade you’ve turned full circle ─ going from sci-fi to a period film? FA: I had maybe a month off or so before I engaged with Bruce (Beresford) for Ladies in Black, which is set in 1959. But the process is kind of similar ─ you need time and conversations to allow ideas to filter through. For period films it’s all about historical research and social history of the time. I don’t find it hard to switch from one to the other and I feel incredibly fortunate to be engaged with two extraordinary projects in one year. BT: You’re currently in Los Angeles ─ have you found your feet? FA: I was the recipient of an Australians in Film mentorship last year and I signed with United Talent Agency, so I’m exploring the U.S. industry and are about to start on a project. I’m committed to working in Australia too and my hope is to work between the two. 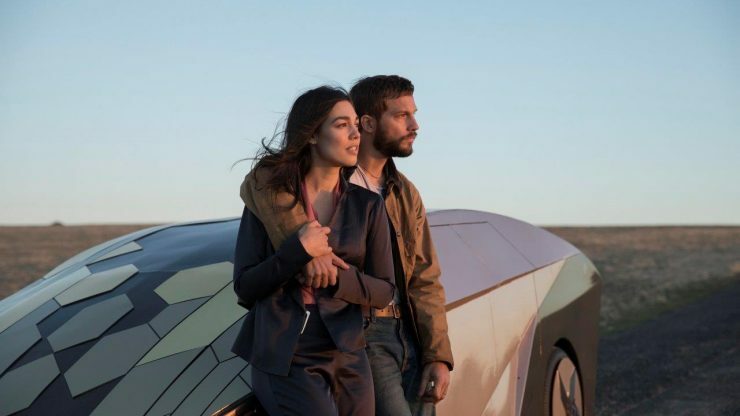 Upgrade releases in the U.S. in June and shortly after in Australia so there’s a lot happening and then Bruce’s (Beresford) film releases later in the year. Felicity Abbott APDG is the winner of Docklands Studios’ Best Set Trophy for 2017, as voted by staff. When not in use by film crews, our sound stages are helping Aussie basketballers reach the 2020 Tokyo Olympics. NBL’s 3×3 Pro Hustle – billed as a stepping stone to Olympic team selection – transformed our biggest sound stage into a grandstand recently for a series of games in front of an audience of around 1,000. 3×3 basketball is a shorter version of the game with three players each side, on a reduced size court. A FIBA-accredited black rubber surface was laid down for the event that drew amateurs dreaming of Olympic glory along with established names such as Andrew Steel, Tommy Greer Tom Wright, Monique Conti and Chloe Molloy. Three courts were set up inside Sound Stage 1 for simultaneous play, while juniors competed on two outdoor courts with the event streamed live on NBL TV. IT heavyweights from around Australia converged on Docklands Studios recently for a one day tech summit hosted by Microsoft. Around 300 CIOs and CEOs etc. experienced the Microsoft Business Forward event that transformed our ‘blank space’ sound stages. Across the day, event planner Andy Mirkovich Productions moved guests between two adjacent stages – one an auditorium for keynote sessions, the other set up with reception, cloak room, meals, lounges, hardware showcase areas and industry-specific break out rooms. Nearby office spaces were used as private meeting rooms. Andy Mirkovich’s man on the ground Tim McAfee said Docklands Studios was a perfect fit for the event, which required excellent acoustics, electricals and rigging, as well as the versatility to create distinct Microsoft branding using signage, lighting and furnishings. Having planned similar Microsoft events in the United States, including one at New York’s World Trade Centre, McAfee rates the Docklands experience as “probably the top event I’ve ever done”. A production coordinator is like a mother hen – getting everybody in the right place at the right time. One of the best in the business is Mim Davis, who’s worked on a raft of productions at Docklands Studios Melbourne since she moved from Sydney to Melbourne four years ago. She spoke to our publicist Bel Tromp about the ups and downs of the job. BT: What exactly is the role of Production Coordinator? MD: It’s working alongside the production manager and coordinating all the cast. So as soon as a someone gets cast, touching base with their agent and making sure that they know what’s required of them, sending scripts, schedules for rehearsals and such – you coordinate everything about them and their movements. Predominantly you deal with cast but you also help set up the office, get a good team on board – a good production secretary and runners are imperative – and just make sure whenever there’s new crew members that they’re all happy and have everything they need for their role. Also it’s being the ‘go to’ person for scheduling meetings with directors, cast and crew. Then it’s organising makeup tests, costume fittings, rehearsals and the general running of the office, and when we start shooting it’s doing the call sheets, liaising with all departments and getting all the information that’s required for each day in accordance with the schedule. BT: When you’re juggling that many things, is there a lot of scope for things to go wrong? MD: Yes, but there’s protocols and there’s processes and you learn along the way. I think when I first started out, you know, you’re so worried about impressing everybody and making sure that you don’t make mistakes that you often make more mistakes! Then you begin to feel more relaxed and comfortable from knowing what needs to be done. To make great film and TV you need to be on the ball, but it’s supposed to be an enjoyable, fun experience because we’re here to entertain the masses and trying to make sure that we have a good time while we do it. You do come across a lot of different personalities with crew and cast but the biggest thing is to be calm (laughs). BT: How did you get your start in the screen industry? BT: Working on Patrick (2013) was your first time at Docklands Studios? MD: Yes it was fantastic. It was a remake of an iconic 1978-horror film – lots of fun, small cast. So that’s where I met Rod (Rod Allan, Docklands CEO) and all the gang and since then I’ve done seven jobs at Docklands – Patrick, Predestination, INXS: Never Tear Us Apart, Childhood’s End (pre-production only), The Moon and the Sun, The Big Music Quiz, and last year I finished Upgrade with (director) Leigh Whannell. BT: What was it like working on Upgrade? MD: It was incredible. Working on feature films seems to be more of a personal experience – there’s one script, there was a small cast, lots of ‘stunties’. We closed down a freeway for three nights ─ we were smashing cars, building futuristic machines, lots of fantastic prosthetics and the story was epic. We had a couple of great actors from America plus the incredible local talent and a great team. There were a few night shoots as well so it got pretty intense, but everyone was just focused on making it all work. BT: Tell me about the night shoots. MD: We would start at 7pm and wrap at around 6am in the morning, and then the next night it would be ­­another 7pm start. We did that for a week near the start and for a couple of weeks towards the end of the shoot. But it was fantastic – I wouldn’t change a thing about the experience because that’s how you learn and grow in our industry. BT: Leigh Whannell has quite a bit of experience in Hollywood – does that show through? MD: Yes and he loved the fact that he was back filming in his hometown. He had worked previously with a lot of crew – like his D.O.P. – and he wrote the film so he was very close to the story which helped every department with his vision. He really looked after the crew. He would organise surprises – once it was the Nutella food truck that arrived at three o’clock in the morning with crazy things like Nutella burgers. A super fun, delicious way of Leigh saying thank you to all the crew for all our hard work. He’s a very generous director – really takes note and appreciates every single crew member helping make his vision come to life. BT: Do you have a favourite project you’ve worked on? MD: There’s a couple – probably one of my favourites was Molly, the TV Series with (actor) Samuel Johnson. That was with Kev Carlin directing and John Molloy producing and it was just a fun-filled vibe. I think maybe because it was around my era – it was all Countdown and vinyl playing constantly from that time – and it was a wonderful story about an Australian icon. Upgrade is another one, again because it was an exciting action packed shoot with great cast and crew. They’re probably my top two but, you know, there are good and tough things about all of them. BT: What are the challenges of working as a freelancer? MD: You don’t know when your next job’s going to be, so you do need to learn time and finance management. It’s great when you are able to get gigs back to back but it means you don’t really have a proper holiday. But you just need to plan. It is important to have breaks because you have a job for three months and it’s intense, its long hours and you’re in an awesome crazy bubble. Since working on Upgrade in 2017, I worked on couple of ABC TV shows then Channel Ten’s The Wrong Girl which shot around the Docklands precinct and used the studios for truck park up. I recently wrapped on another feature film which also used Docklands Studios for truck park up plus we filmed in a one of the stages for a few days. BT: What do you like about working at Docklands Studios? MD: The best thing about Docklands is the people who work there – like Lisa, Brooksy, Rosey, Laz, Andrew and Anton (who has since moved on) – they’re awesome. Lisa on the gate is fantastic and I’m not sure how she does it but she remembers everyone’s name as they come through. Broosky is a top bloke who is always happy to help – even from the golf course on a Sunday! When it’s busy at the studios and there are a few productions at the same time, the Docklands team handles it very well and always get things done in good time and with good humour. It’s a great facility. Production designer Matthew Putland blended historical accuracy with artistic licence for the recently released Helen Mirren thriller Winchester. In recreating rooms from the famous San Jose mansion that Sarah Winchester (Mirren) started building in the late 1800’s, Putland drew inspiration from old images and a visit to the mansion. Filmed at Docklands Studios Melbourne in early 2017, Winchester was Putland’s second project at Docklands with writer-directors Michael and Peter Spierig and producer Tim McGahan, following Predestination (2014). Putland spoke to Bel Tromp. MP: When I first did a Google search on the Winchester mansion I found there wasn’t much online because they don’t let anyone take photos at the house. When I visited I was overwhelmed – the layout was such a confusing mix of architecture. Michael Spierig joined me on the first day for the guided tour and for the next three days I was there by myself. Even on the last day I needed a guide because I kept getting lost. It was mindblowing to think this widow Sarah Winchester had built such an expansive house, adding on rooms and corridors and hallways and staircases. An exact replica of the switchback staircase was built at Docklands Studios (still from trailer). BT: The mansion has been described as a labyrinth and has more than 160 rooms. Which spaces did you build as sets? MP: The (Tom Vaughan and Spierig Brothers) script dictated where the scenes took place, and those scenes were written to take advantage of the eccentricities of the house. For example, the switchback staircase is a notorious part of the house that we recreated stick for stick at Docklands Studios. There was another staircase that led nowhere, stopping at the floor above, so we built that oddity as well. Then we built the main entry and corridor where characters come and go, to replicate as close as we could to what existed in San Jose. As well we built a séance room – a cone shaped tower which, at the real house, has a strong presence and was something that Peter and Michael wanted to include. This was an iconic room because it was here that Sarah spoke to the spirits to find out the layout of the room they died in, so she could appease those spirits by having that room reconstructed at her mansion. The séance room at the California mansion was recreated as a set at Docklands Studios (photo: Ben King)BT: An earthquake damaged the original Winchester house. How did that affect the way it’s depicted on screen? MP: The film is set in 1906, the year of the big San Francisco earthquake which destroyed a large part of the house, so we wanted to show the house before and after. The historian had a photo of a seven stories high tower that was severely damaged in the earthquake so we created that. Also there was a chimney on the front of the house which had crumbled and fallen over, so we built that. We used the earthquake to give us some freedom with how we showed the house before that event, adding some rooms that may not have been in the original mansion. One of these was a garden room modelled closely on one at Rippon Lea mansion in Melbourne – we shot scenes there and built that as a set at Docklands Studios. BT: What are some of the tricks you used to make the house look creepy? MP: A lot comes through lighting, such as lighting at the end of corridors to silhouette the cast. With the colours, we deviated from the palette inside the real house. The historian showed us a very pale lime green but for the horror genre we decided to keep the colours intense – a darker green was our main colour along with a tobacco colour and the richness of timber. On the exterior we kept the colours as they were historically – a dark grey trim with a grey green façade. We created a sense of luxury and opulence using designs and features from the actual house such as stained-glass windows. The Victorian era had layers and layers of decoration and we sourced great props from all over the place including the antique shops in Melbourne which are some of the best. I had a great team, including Janie Parker (art director) and Vanessa Cerne (set decorator) who are both Melbourne locals and were key players in achieving the look of Winchester. BT: You made the most of Melbourne’s historic mansions from the same era? MP: We did a lot of location shooting at heritage buildings. At Rippon Lea we not only used the conservatory but also the servants’ quarters. We used the Werribee and Labassa mansions to shoot interiors and an old railway workshop at Newport. It was great to find all these locations that we could pass off as the house. The spaces were more expansive than rooms at the real house which helped us fit in our film crew and we confined the spaces with furniture. BT: What was your biggest challenge? MP: Other than budgetary I think it was dealing with the various depictions of the house that we shot in Docklands Studios and around Melbourne, along with scenes shot at the real house in San Jose. We brought it all together in one cohesive look. For example there’s one scene in the beginning where you start inside the set, followed by a point of view from the real house, then you end up on location. It’s all in one fluid movement and made to feel like it’s in the one place. BT: You were on familiar ground working with the Spierigs? MP: I went to university with Peter and Michael Spierig and I was in Tim McGahan’s class at uni, so our connection with film goes way back, to around 1996 at Queensland College of Art in Brisbane. I designed the Spierig’s ultra-low budget zombie film Undead, and I was involved as set decorator on their film Daybreakers. Then we did Predestination at Docklands together, so I was glad they were willing to give me another go with another subject – same directors and same D.O.P. (Ben Nott) so the process is the same. BT: What do you like about working at Docklands? MP: The biggest bonus with Docklands is its position. It’s smack bang next to the centre of Melbourne so to get anywhere is easy and to get to the studios is easy. And you’re in amongst everything – it’s just around the corner to a vintage wallpaper shop or an antique emporium. Our studio lot has been abuzz with activity recently as home base for film and TV productions shooting in rural Victoria. Rachel Griffiths’ directorial debut Ride Like a Girl is in pre-production for an 8-week shoot from mid April that will feature landmark locations including Hanging Rock and Ballarat. A biopic of Melbourne Cup winning jockey Michelle Payne starring Teresa Palmer and Sam Neill, Ride Like a Girl is tipped to inject $14 million into the state’s economy and is scheduled for the big screen in early 2019. It tells of Payne’s personal struggles as one of ten children raised by their father Paddy after their mother’s death. Meanwhile British-Australian co-pro The Cry made itself at home on the lot while on location around Victoria. Executive Producer Claire Mundell of Scotland-based Synchronicity Films raved about the ‘incredible Australian light’ while shooting in various coastal towns including Queenscliff. The Cry is a four part psychological thriller about a young couple whose baby is abducted, and stars Alex Dimitriades and Asher Keddie alongside major British names Jenna Coleman and Ewen Leslie. The Cry is also shooting in Glasgow with support from Film Victoria and Creative Scotland and will screen on ABC TV later this year. The team at Docklands Studios Melbourne has a reputation for making productions feel at home – time after time our clients tell us how easy it is to work here. So it’s only fitting that some of our crew feature in a brand new ad campaign, being rolled out during 2018 in publications such as Inside Film magazine. CEO Rod Allan came up with the idea of putting individual faces to our brand. On the day, Rosey Cullinan, Andrew Tran, Rodney Brooks and Laz Tsavdaridis stepped into the spotlight, with Allan himself keeping a slightly lower profile. Here’s a sneak peek at the new ads. Thanks to graphic artist Sarah Rudledge for coming up with the concept design and helping out with copy, designer Jo Briscoe and builder Ben Corless for creating the film set, and photographer Lisa Saad for helping our staff feel comfortable in front of the camera. Here’s Lisa’s time lapse clip showing how the shoot came together in our sound stage. The red carpet was rolled out for the nation’s top production designers at a Docklands Studios-sponsored awards evening in Melbourne on December 3. The Australian Production Design Guild ceremony at the Melba Spiegeltent in Collingwood awarded trophies in 23 design categories in live performance, screen, animation, interactive and web. APDG President George Liddle acknowledged Docklands Studios Melbourne as the awards’ Principal Sponsor, and thanked studio CEO Rod Allan for being “a staunch supporter” since the annual competition began seven years ago. Academy Award winning animator Adam Elliot hosted the popcorn-and-bubbly-fuelled ceremony, with Rod Allan presenting two Docklands-sponsored awards – for Set Decoration on a Feature Film (won by Nicki Gardiner for 2.22) and for Production Design on a Feature Film (won by George Liddle for The Osiris Child: Science Fiction Volume One). Docklands Studios Melbourne has shown yet again it’s a place where anything is possible, catering for screen projects of all shapes and sizes in 2017. (Above) The set of Winchester: The House That Ghosts Built, starring Helen Mirren. Interiors of the haunted mansion were pieced together in Stage 4 to match scenes shot at the real Winchester mansion in San Jose. Produced by Tim McGahan and Brett Tomberlin, directed by Michael and Peter Spierig, production design by Matthew Putland, art direction by Janie Parker, set decoration by Vanessa Cerne. Release date February 22, 2018. (Above) The set of the ‘hybrid’ documentary Guilty, produced by Maggie Miles, directed by Matthew Sleeth, production design by Nicki Gardiner. The filmmakers re-created the last days of convicted Bali Nine drug smuggler Myuran Sukumaran who was executed in Indonesia in 2015. The film screened at the Adelaide Film Festival in October 2017. (Above) The main set of sci-fi thriller The Wheel, produced by Sunjive Studios. Cardboard sheets assembled with a hot glue gun were used as a cost-effective, environmentally-friendly addition to the main set built of steel. Liam McLachlan, 20-year-old son of the movie’s director Dee McLachlan, built the cardboard sets in around two weeks with a couple of friends, under the guidance of production designer Robert Webb. To be released in late 2018. (Above) The Docklands Studios production office doubled as a movie set for the independently financed thriller Choir Girl. Other sets of a hotel and apartment were built in a nearby sound stage. Produced by Ivan Malekin of Nexus Production Group, production design by Fiona Delalande. When Andrew Tran answered an advertisement for an IT job 13 years ago, he never imagined he’d be working behind the scenes on movie and TV productions. As IT Manager at Docklands Studios Melbourne, Andrew’s in charge of setting up the communications technology – phones, computers, internet, etc. – that keep productions rolling. You are the only member of our operations team who’s been here since the start – what do you remember of the early days? Things were very different when the complex opened back in 2004. We were called Central City Studios and we didn’t actually have an admin building. Our office was in a demountable shed and the car park was just gravel so when it rained there’d be puddles all over the place. We had to lay down wooden planks to cross the water so it was like being in the trenches! The first production we had here was Ghost Rider and that was huge – it took almost the entire lot. Typically, what IT services do you provide to productions? Usually it’s making sure they have Wi-Fi for email and the internet, and for sending recorded footage to the post-production house which might be interstate or overseas. For example when The Leftovers (HBO Series 3) was based here in 2016 they sent a lot of their footage to the United States and it was edited there in real time. Some productions also need a Network Area Storage where there’s a central storage for all the data, allowing each department to access it. For example an art department can share its drawings, so anyone can update them. Productions rely on you to supply good bandwidth? These days everything is sent via an internet link. Previously productions might store everything on hard disk drive or film whereas now it’s digital. They send footage to secure sites like VIMEO so approved people can look at draft versions. If we need to increase bandwidth we can call on our providers to scale up to 1 GB on demand. We currently have a 400 MB link and a 50 MB scalable link on standby, so a production can call me and say ‘I need a special 200 MB link because we’ll be sending videos to America’, and I can arrange that within a few days. That’s good to have when we have multiple productions on the lot. Most crew need an extensive phone system? People still use landlines because they want to be professional and it helps things run smoothly. With a phone system you can overflow to different phones and transfer calls, and with a crew list it’s easy for people to contact each other. The phone system is IP based so there’s virtually no limit – a big production might need 100 to 150 handsets, but we can fit up to 300. How early in a new production do you get involved? Before the crew arrives I liaise with the production manager about the IT and communications requirements and I send floor plans of the work areas that they’ll be occupying. They mark out where they require the phones, internet outlets and Wi-Fi access points and I provide a quote. The good thing about production crew from my point of view is they don’t come all at once. For example we have one at the moment with just the line producer, the coordinator and the location manger so this week there are only three people for that production. I can easily manage installations for batches of ten to twenty people but if I need help I can call in contractors. Then as the crew arrives, I train them on the phone handsets and the internet, I set up their printers, and so on. Do gremlins sometimes interfere with things? There can always be problems along the way. For example on one production I got a call from a particular department saying their computers kept getting disconnected. So I went over and looked at the network of that particular building to check each connection one by one. Then I noticed one particular computer had no anti-virus software and I discovered it had a virus. So I cleaned the computer, installed anti-virus software and put it back on the network. That took at least an hour to figure out. That sort of thing can happen because productions crews are mainly freelancers who bring their own laptops, although nowadays most new computers come with anti-virus software so it’s becoming less of a problem. You also run all the IT systems for the studio admin? I’m in charge of phones and computers in the admin building, and I help maintain the website. I also oversee technology like the CCTV cameras that monitor the external areas and feed data back to a server. And since we became state government owned in 2008 I have to make sure our I.T. systems comply with government standards. Working behind the scenes, how much of the filmmaking process do you get to see? Sometimes I get to see productions up close. For example with The Pacific mini-series (2010) we’d see soldiers practicing their marching in the car park. Another one I remember was Where The Wild Things Are (2009) – the costumes and the prosthetics for the monsters were amazing and the sets looked so real. From time to time I catch a glimpse of a big name actor – Kate Winslet (The Dressmaker, 2015) walking to get her costume fitted, or Helen Mirren (Winchester: The House That Ghosts Built, 2018) strolling to the canteen. One time I went to Guy Pearce’s ‘star van’ to help him connect his laptop. It’s great to see how filmmaking works and it makes me look at movies differently when a film’s been shot here. You’ve seen big changes around here since you started? In the past the Docklands area had lots of old sheds and it was pretty deserted. Now there’s so much activity and so many food outlets, and soon we’ll have a new supermarket and a cinema complex nearby. I can hardly believe it’s been 13 years since I started. There’s no project- whether it’s a film or TV series, a domestic or international project – that’s the same. I feel really fortunate to be able to see filmmaking as part of my day. When it comes to car launches, Docklands Studios Melbourne has done some serious name dropping lately. In December, Jeep unveiled its new range to a select audience in sound stage 2, with a touch of black-curtain glamour and excitement described by one guest as ‘Detroit goes to Hollywood’. The show-and-tell by leading experiential marketers Dig and Fish included every new Jeep destined for the Australian and New Zealand market in 2018, including the Compass SUV. Back in October in the same space, Ferrari Australia popped the cork at a black tie cocktail party to showcase its $12-million Aperta, dubbed ‘the most expensive limited edition supercar in the world’. Melbourne-born, ‘Friend of Ferrari’ supermodel Jarrod Scott was behind the wheel of the Aperta as it roared into the cavernous space, one of a series of celebrations around the world marking Ferrari’s 70th anniversary. The event was arranged by the local arm of international media production agency, Damn Good Productions. Australia writer-director twins Michael and Peter Spierig spoke to IF Magazine about their latest film centred on a famous San Jose mansion. The Legend of Ben Hall production designer Das Patterson and property master Steph D’Alessi shared their secrets with students at Melbourne’s Victorian College of the Arts in August. In a Master Class on production design on a micro-budget, Das and Steph explained how they recreated 1860’s bush huts, a general store and a hotel for the 2016 bushranger epic. Dubbed a ‘genius’ by producer Russell Cunningham for his work on the film, Patterson explained the use of time-and-money-saving cheats such as a shipping container, miniature buildings, and rough beams salvaged from timber yards. During two weeks in a sound stage at Docklands Studios Melbourne, Patterson and D’Alessi dressed 3 main sets into 13 different interiors. The Master Class was hosted by Docklands Studios Melbourne and the VCA. Docklands Studios Melbourne has cemented its reputation as THE place to shoot a car TVC – the latest is for Mazda. Ad producer Studio Pancho chose Docklands Studios as it allowed them to have complete control of the light and illuminate the car like art in a gallery, reflecting the brief by creative agency Grant Day James. Over 4 days in Sound Stage 3, Studio Pancho filmed several Mazda models under different lighting, while post-production added swooshes of colour and graphics to convey the car maker’s “Art of Value” philosophy. Other cars ads filmed at Docklands Studios in recent years include Kia, Toyota, Hyundai, Porsche, Volvo, Jeep, BMW, and Ford. Check out this amazing time-lapse video of the talented crew at Mediatec and Resolution X – you won’t believe how fast they can transform a space. In just 48 hours they turned Sound Stage 4 into a breathtaking showcase of event technology. Several hundred guests experienced the wall-to-wall, floor-to-ceiling visual display, complete with the latest in LED screen technology; broadcast, camera and vision control systems; hundreds of lighting fixtures and effects such as a mirror ball wall; and ‘Australia’s largest chandelier’. There was even a conveniently placed chill-out zone for those at risk of sensory overload! It was the first showcase of its kind for both companies and Docklands Studios Melbourne was integral to its success. Docklands Studios is hoping to host the showcase again next year. In the meantime you can see Mediatec and Resolution X work their magic at various major sporting events, festivals, music, theatre, community and corporate events. Visitors to Docklands Studios will be familiar with the friendly face of Lisa Barnes. As the security gate attendant, Lisa has seen all types – from starry-eyed TV audiences, to bleary-eyed film crew, as well as a long list of famous actors and producers. Lisa spoke to Bel Tromp about her job. How long have you worked at Docklands Studios? I started almost 8 years ago, having worked in customer service in the retail sector. My first stint at Docklands was in the security office for a TV show that was filming here, Talkin’ ‘Bout Your Generation. Coincidentally that show is on the lot again right now, filming a whole new series, so it’s like déjà vu. Anyway, I love my job – working with the production crew and helping them out and being able to talk to them. I didn’t know much about Docklands Studios before I came here, but now many of my friends are film and TV crew I’ve met here over the years. Take us through a typical day. When we’ve got new productions on the lot, my day could start at 7am. I work closely with each production secretary, because they have to authorise to allow each person on site. Earlier this year we had multiple films including Stem and Winchester. I think Stem had 140 people and that’s just the main crew, not extras or actors. Then when Winchester was shooting as well, that was another 120 coming through the gates. With each new visitor I have to make sure they get to the right place on the lot, whether it’s production or costume or somewhere else. I also deal with couriers delivering things like props, costumes, production tapes, payroll forms. Again I direct packages to the right person so they don’t get lost, which can be tricky when a production is spread across several buildings. It’s all pretty full on. We also get a lot of production vehicles coming through the gates, including huge trucks that need to be parked here. But we can always find a way to fit them in as we’ve got plenty of space. I have great back up from Steve and Laz and Rodney* – we’re a good team. *Steve Wyatt, Security; Laz Tsavdaridis, Facilities Co-ordinator; Rodney Brooks, Facilities Manager. You must know most of the production secretaries in the industry pretty well? Yes, and each one is different. For example, one will want to know the minute their talent arrives, and others are more relaxed. Some are a lot stricter about who can and can’t go on site, such as when a crew member brings along a family member. So, I’ve got to chop and change to deal with different styles. That’s why they like it here, because I already know what their style is and I know most of them by now. Every production that comes here has at least a couple of dozen people who’ve been here before. People say you have a good memory for faces and names? Yes, I can’t really explain it. Usually I can look at the face and remember the name, but sometimes I just look at the car rego and remember their name! Another aspect of your job is welcoming members of the public who come to be in a TV audience? Yes, we could have a couple of movies going while we’re also dealing with audience for shows like The Footy Show and Hot Seat Millionaire. We’ve got to work out who is crew and who is audience, who’s supposed to be there and who’s not, in case the audience try to wander away. I think Hot Seat has 160 and The Footy Show has over 200 and they could be arriving over a short period. On those days I barely get breakfast or lunch! Most people are very excited to be here, and they have no idea what’s going to happen and what they’re going to see. Some people turn up two hours early because they’re scared they’ll be late or stuck in traffic! At the other end of the scale, you greet A-listers turning up for exclusive events such as car launches or fashion shows? Yeah, a lot of visitors will come in a hire car, a limo, but for me it doesn’t matter, they’re all treated the same. And when a hire car arrives, I have to actually see who is inside for security reasons because anyone could hire a limo. Sometimes the drivers don’t like it, but it’s my job. I have to be a step ahead, especially when there’s a high-end celebrity on site. I’ve stopped so many people from trying to talk their way in – they try to trick you! A long list of famous actors have worked here over the years? I know you don’t like to drop names, but you must have some favourites? Well, when people come through the gates they’re just another crew member on the lot to me. I don’t care if they’re famous or not and I just treat them like anyone else. But one that springs to mind would be Hugh Jackman, who was here to rehearse a stage show, and he stopped every day to ask me how I was going. Another is Ethan Hawke who was shooting Predestination, and later sent his driver around with some cakes to say thank you. Then there’s Shane Jacobson, who always remembers my name, and Shaun Micallef who recently told me: “I was driving in today hoping that you would be here!” He hadn’t been here for a few years so it was good to be acknowledged in that way. Another nice one is Sam Newman from The Footy Show – he’ll run in front of me and open doors! You’ve had the odd surprise visit? Yeah, I was here early one morning and I saw a hot-air balloon come in low. I was waiting for it to go up and it never did, it just suddenly hit the ground hard. Luckily the pilot found the perfect landing spot in the car park. I ran over to see if everyone was ok, and I was about to call emergency services, but the people in the balloon were actually quite excited about where they had landed and started taking photos! The pilot told me he had landed in the Yarra River the week before. Have you seen this part of Melbourne evolve over the years? Yeah, it’s changed dramatically. When I first started working here at the end of Docklands Drive it was like being in the naughty corner! But now there’s so many buildings going up and there’s lots of greenery and the park nearby, and more people know that we’re here. Before, no one had a reason to be near the studios, whereas now they come past to have lunch in the park. It’s really vibrant and alive. Inside Film’s Jackie Keast examines why Docklands Studios appeals to smaller productions. Staying true to its goal of supporting emerging filmmakers, Docklands Studios recently welcomed debut writer-director John Fraser and his independently financed Choir Girl. Shot in black and white, Choir Girl is the story of a lonely photographer obsessed with a teenage prostitute being controlled by an underworld criminal. It stars Peter Flaherty (The Leftovers), Roger Ward (Mad Max), Krista Vendy (Neighbours), Andy McPhee (Ali’s Wedding), Kym Valentine (Neighbours), Jack Campbell (All Saints), and VCA graduate Sarah Timm. Fraser completed the gritty urban look at various Melbourne landmarks including Pentridge Prison and St Kilda’s Oslo Hotel. During their time at Docklands the cast and crew of Choir Girl rubbed shoulders with a number of larger productions, including the Spierig Brothers’ Winchester, starring Helen Mirren. “It adds a certain level of legitimacy and excitement to the production when you’re rolling up to work at Docklands every morning – you get a good energy in the air,” said Malekin. It’s a long way from a prison cell in Indonesia to Docklands Studios Melbourne. Yet here in a brightly lit sound stage a film crew has been recreating the final days of Myuran Sukumaran, an Australian drug trafficker executed in Indonesia on April 29, 2015. In an intimate set dwarfed by the vast space, actor Adam McConvell channels a frenetic Sukumaran, painting his final artworks as he awaits the firing squad. Around the set are tangible connections to Sukumaran – five of his paintings were loaned to the production by his family. Christie Buckingham, Sukumaran’s real life spiritual adviser, represents herself in these final scenes and debut director Matthew Sleeth befriended Sukumaran while running art classes in Bali’s Kerobokan Prison alongside Archibald Prize winner Ben Quilty. These scenes inside the cells, filmed over five days, are what producer and co-writer Maggie Miles describes as “the soul of the piece”, adding “it was only a dream that we could film at Docklands Studios Melbourne. [CEO Rod Allan] was really supportive and we’re very grateful for his belief in the project”. These creative scenes will be edited with archival footage of Sukumaran’s case and that of fellow Bali Nine prisoner Andrew Chan, interviews, and footage from a posthumous exhibition of Sukumaran’s work held as part of the Sydney Festival last January at Campbelltown Arts Centre. Guilty will debut at the Adelaide Film Festival in October. The team from Guilty includes director and co-writer Matthew Sleeth, producer and co-writer Maggie Miles (The Turning), co-writer Matthew Bate (Shut Up Little Man) and script consultant Andrew Bovell (Lantana). The executive producers are Robert Connolly (Paper Planes) and Rebecca Summerton (Sam Klemke’s Time Machine). Guilty has been supported by HIVE (a collaboration between Adelaide Film Festival, ABC Arts, Screen Australia, and Australia Council), Good Pitch, Film Victoria, and private investment. It’s not every day The Fastest Man Alive appears in one of our sound stages. On this occasion, Usain Bolt came by to shoot an ad campaign for Optus. With the Olympic champion on a tight schedule, the ad makers built a series of bespoke and green and blue screen sets, to move Bolt efficiently through takes. The series of 5 to 45 second TVC’s by creative agency The Works and production company Emotive, were designed to showcase the Optus 4G Plus network. With the slogan “Ever Wondered What Life is Like at the Speed of Bolt?”, the campaign taps into the fun side of Bolt’s personality, showing him sprinting as the ground explodes, watching soccer on his phone and dancing to music. Shot entirely at Docklands Studios, the campaign builds on the telco’s relationship with Bolt who starred in the 2016 “Relentless” campaign. 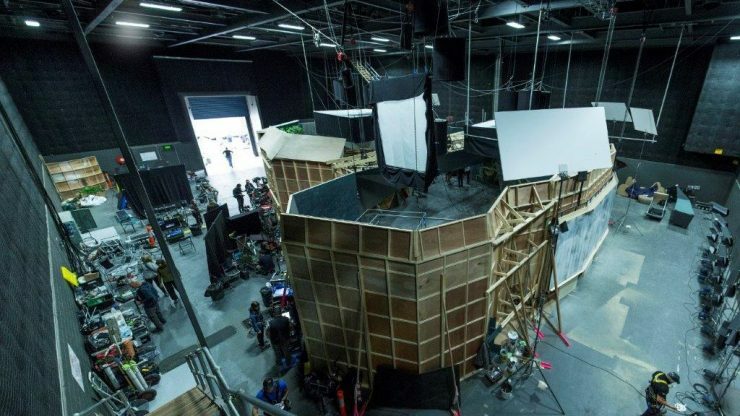 An Australian film found a unique way to save time and money while shooting at Docklands Studios Melbourne – making some of the sets from cardboard. Like most indie productions, the sci-fi action feature, The Wheel sought a big look on a limited budget. The challenge was to build a 15-metre-long concrete corridor for the story about a paraplegic inmate who becomes a ‘lab rat’ in a scientific experiment. The corridor had to match the concrete interior of the Hoppers Crossing Pumping Station outside Melbourne, where other scenes were being filmed. The producers flinched at quotes for building the set with the usual materials such as plywood, steel or cement, and even considered omitting the corridor scenes. Enter Liam McLachlan – the 20-year-old son of the movie’s Director Dee McLachlan – who knows a thing or two about cardboard. Since age 13, Liam has been obsessed with Boxwars, a hobby where people construct elaborate costumes and props for themed battles in public parks. Having built armour, weapons and four-wheeled vehicles from cardboard, designing a corridor was all in a day’s fun for Liam. Under the direction of production designer Robert Webb, Liam used an open source computer program called Blender to create a 3D-model where he could place a virtual camera inside the world of the set. “Everyone was incredibly sceptical that it would ever work. I think we slowly convinced them, and once we did a trial day, which showed them what it would look like, Rob, the designer was instantly sold. He loved it,” Mclachlan said. The build took less than two weeks, with McLachlan working alongside close friends and fellow Boxwars enthusiasts, Will Burgin Stevenson and Noah Burdekin. A hot glue gun was used to put the panels together. “That stuff is amazing, it dries in about 30 seconds, and it’s cheap!” Scenic artists then came in to complete the concrete bunker effect. Naturally there are limits to the amount of pressure cardboard can withstand. Three other sets for the movie – a board room, a control room and a ‘steel’ room – were built from timber, steel and plywood or a combination of these materials. The cost of cardboard is a fraction – Liam estimates around one tenth – of other commonly used building materials. Other cost savings were found by shooting at Docklands Studios, according to The Wheel producers Veronica Sive and Silvio Salom. “Regardless of the external conditions, in the stage we could shoot 10 hour days on the various sets. With two cameras rolling on one particular day we managed 88 set ups,” said Sive. As for the cardboard sets, McLachlan might have just stumbled on a winning business idea. Completing a Bachelor of Science at Melbourne University majoring, not surprisingly, in physics, McLachlan has already been contacted by at least one other screen production, while the producers of The Wheel hope to use his skills in their next movie later this year. The Wheel is produced by Veronica Sive and Silvio Salom of SunJive Studios and directed by Dee McLachlan (Out of the Shadows, The Jammed). It stars David Arquette (Scream) alongside Jackson Gallagher (Patrick, Home and Away) and Kendal Rae (Out of the Shadows, The Shannara Chronicles). It tells the story of a paraplegic inmate (Jackson’s Matt Mills) forced to take part in a scientific experiment that will give him use of his legs. Dr Emmett Snyder (Arquette) along with Dr Allison Turner (Rae) push Mills to breaking point, as he fights off a succession of assailants, mysteriously becoming stronger. “A little bit weird and a little bit different” is how showrunner Damon Lindelof describes Melbourne. Fairfax film writer Karl Quinn talks to Berlin Syndrome director Cate Shortland about piecing together a film shot on opposites sides of the globe. We’ve started the year on a high note, with all five sounds stages fully booked. Among the productions is The Wheel, directed by Melbourne filmmaker Dee McLachlan (The Jammed) and featuring Hollywood actor David Arquette, who starred in the 1990’s Scream franchise. Arquette joins Victorian actors Jackson Gallagher (Home and Away) and Kendal Rae (Out of the Shadows) in the independently financed feature set in the near future where prisoners are the subjects of scientific experiments. Producer Silvio Salom said “The Wheel is the first of a slate of films that SunJive Studios is embarking on in a privately funded business model aimed at creating a sustainable flow of productions in Victoria. Docklands Studios has been extremely accommodating allowing us to create a film look that is many times the actual budget”. Victoria’s Minister for Creative Industries, Martin Foley, visited the set of The Wheel on April 6, declaring that the production boom was “a sign of the strength, and diversity, of Victoria’s screen sector”. Also on the lot, another local project, Choir Girl is underway. The low budget thriller, starring former Neighbours regulars Krista Vendy and Kym Valentine, tells the story of a lonely photographer who becomes obsessed with a 15 year old girl. And a feature length documentary Guilty, has taken over a sound stage for a two week shoot. The film marks the directorial debut of Melbourne artist Matthew Sleeth and details the final 72 hours in the life of Myuran Sukamaran of the ‘Bali Nine’. Other sound stages are occupied by Winchester and Channel Nine’s live audience programs, The AFL Footy Show and Millionaire Hot Seat. Anthony Galloway, State Political Reporter for the Herald Sun joined Victoria’s Minister for Creative Industries, Martin Foley on a visit to our sound stages. Victoria’s scenic landscapes and some Melbourne landmarks will flash across U.S. screens in April, when HBO launches the third season of The Leftovers. With leading character Kevin Garvey (Justin Theroux) at large in Australia for this final series, the official trailer provides glimpses of Victoria’s vast open spaces, the red dirt roads of the outback, and Melbourne’s Port Phillip Bay with the iconic West Gate Bridge in the background. The city’s trademark graffiti lane ways and 19th century State Library reading room are part of the backdrop as Garvey deals with impending doom foretold by the words “13 days to go” written in the sky. The Leftovers, co-created by Damon Lindelof (Lost), tells of those left behind after the Sudden Disappearance of two per cent of the world’s population. Series one and two were filmed in New York and Texas respectively, with the producers choosing Victoria for the final eight episodes which shift the story to Australia. 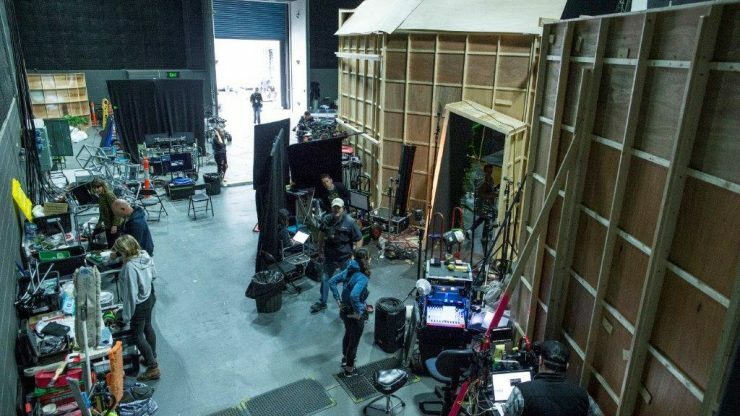 The series used Docklands Studios sound stages, construction workshop and various production offices during a three month stay in 2016. The Leftovers will screen on HBO on April 16 and Foxtel Australia on April 20. Ahead of the release of director Cate Shortland’s stylish new psychological thriller, here’s a peek inside the Docklands Studios set of the Berlin apartment where much of the action takes place. A team led by production designer Melinda Doring created the apartment where Andi (Max Riemelt) keeps Clare (Teresa Palmer) captive over several months after they meet on the streets of Berlin. The designers matched these interiors, as well as a specially built facade, with exteriors of a real Berlin apartment block that Doring and Shortland identified on an earlier visit to the German city. Filming was split between Berlin and Melbourne during 2015. Doring’s team, which included Stephen Speth in Berlin and Janie Parker in Melbourne, captured the look and feel of a rundown East Berlin apartment block, right down to light fixtures brought in from Berlin and details on the small, double glazed windows that help keep Clare imprisoned. Festival screenings at Sundance, Berlin and Glasgow indicate the film, produced by Polly Staniford, is set to be a hit with both audiences and critics. The sets have already garnered one gong – the Docklands Studios Best Set Trophy for 2015! Berlin Syndrome is scheduled for worldwide theatrical release in April. Fairfax Media reports that the Australian film industry has started 2017 on a high. 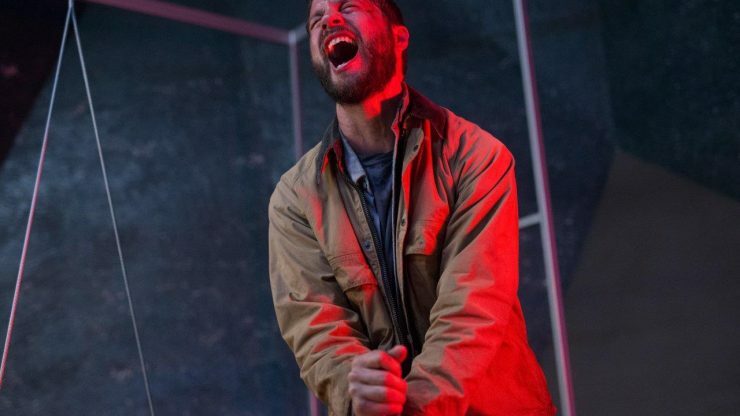 “Saw” co-creator Leigh Whannell returns home for his latest production, as Fairfax Media looks back on his brilliant career. Hollywood producer Eugene Kelly – a long-time fan of Docklands Studios – sat down with Fairfax business reporter Lucy Battersby to explain the appeal of working in Melbourne. A staff writer for If Magazine recently reported that two television series – Tomorrow When the War Began and Jack Irish together with feature film, The Berlin Syndrome – have recently finished filming at the Studios and are now in post-production for release next year. Oct 10, 2015 Journalist, Steve Dow for The Saturday Paper writes a long feature on acclaimed director Jocelyn Moorhouse’s return from the US because family was more important than the Hollywood machine. And how finally The Dressmaker came to fruition and was filmed in rural Victoria and at Docklands Studios. Aug – Sept 2015 If Magazine covers the benefits of a Melbourne-based studio shoot at Docklands Studios, a facility that is slowly changing industry perceptions that it is only for big budget Hollywood projects. The article highlights a variety of projects shot at the Studios recently and emphasises the advantages of weather proof buildings, on-demand technical services, office space, parking, art department and storage facilities all contained on the Studio lot. Victoria’s screen sector being "Shaken, not stirred in the 2014-15"
National Film Editor, Karl Quinn reports for The Age and The Sydney Morning Herald on the performance of Victoria”s screen sector being “Shaken, not stirred in the 2014-15”. He reports that Melbourne”s Docklands Studios had a “good year” and covers highlights of other Creative Victoria screen entity”s including ACMI and Film Victoria. The International Business Times reports on the upcoming premiere of The Dressmaker shot at Docklands Studios Melbourne and on location in Victoria. Director, Jocelyn Moorhouse; producer, Sue Maslin and stars including Liam Hemsworth, Judy Davis and Hugo Weaving expected to attend. National Film Editor, Karl Quinn reports for The Age and The Sydney Morning Herald on how the makers of the recently released and hugely popular family feature film, Oddball managed to make a successful movie featuring both animals and children. The scenes of fairy penguins and children on the beach at night were shot on a coastline and beach set at Docklands Studios Melbourne. The Age features time lapse video of set construction at Docklands Studios Melbourne for Oddball. I have worked in studios around the world and shooting at Docklands was my best studio experience in more than 40 years of producing.